There is no such thing as a perfect horse. We just have to accept that even the best horses have flaws and it’s just a case of deciding which flaws we are happy to deal with. For Scottie, one of his flaws is hacking. Don’t get me wrong, he’s not dangerous, in fact he is probably one of the safest hacks I’ve ridden in a long time, but he has always had fairly unpredictable silliness out hacking. Hacking out by ourselves he is a massive wimp and usually needs a lot of encouragement to get him past anything remotely scary. But he is perfectly safe, it can just be quite frustrating taking 5 minutes to get past a cone what wasn’t there last time! The worst moment we have ever had hacking out alone was when several deer jumped out the hedge right in front of us and Scottie turned round and trotted off 50-100m, so hardly scary! Another of Scottie’s hacking flaws happens both hacking alone and in company, although usually in company. It is something what many people experience and it’s jogging. Now this doesn’t bother me too much with Scottie, mainly because it doesn’t last very long. However, I do feel a bit guilty when Scottie’s jogging upsets other horses we are out with. From my time with Scottie, I have recognised that he jogs for two reasons; Anxiety and Excitement. If we are hacking out alone and it’s been particularly scary, we tend to have a very bouncy walk, breaking into jogging every now and then. Scottie hates being left behind when hacking in company, so if we are hacking with horses what walk faster than Scottie, he will often jog along behind to keep up. Although, as his schooling has improved, he is now walking out more often than he jogs. The other time Scottie jogs is out of excitement. If there is a lot going on or we have been doing a lot of fast work/approaching somewhere we usually have a canter, Scottie does occasionally jog, rather than walk. Now I know that lot’s of people hate jogging and they always stop the horse from jogging. But I have decided against doing this for Scottie. The main reason why is whenever Scottie has been jogging bad enough for me to want to try and stop it, interfering in any way just makes him come up higher and higher in front and stop going forwards. This just makes the whole situation worse, upsets him more and I realistically think if you kept pushing it, his way to cope would be to rear or leap in the air. The second reason why I don’t try to stop him jogging is that 99% of the time, if I ignore the jogging, become a sack of potatoes in the saddle and not pull the reins, he relaxes and comes back to walk himself. If that doesn’t work then asking him to trot on for a while helps get it out of his system. If these easy tricks get him to stop jogging by himself why would I choose to have an argument with him which could turn very dangerous? Scottie’s worst hacking behaviour is the most dramatic, but also the shortest, funniest and the most likely to upset other horses. There are some stretches of grass/mud which Scottie thinks are the perfect place for a canter. Occasionally when turning onto these places he tucks his chin into his chest, grunts or squeals and does 2-4 very bouncy strides of canter, usually sideways to the right! He is more likely to do this if he is behind and if you don’t push him forwards into canter he immediately comes back to jog/walk after these few strides. I’m convinced this comes from his racing career as national hunt horses show very similar behaviour at the start of their races. This behaviour is so unpredictable I wouldn’t know how to go about stopping it. Sometimes its places we have cantered before, sometimes it’s places we have never cantered before, sometimes it’s places we have never been before. Sometimes it’s wide open spaces, sometimes it’s bridleways. And again, it’s one of those things which doesn’t really bother me, so why mess with it? 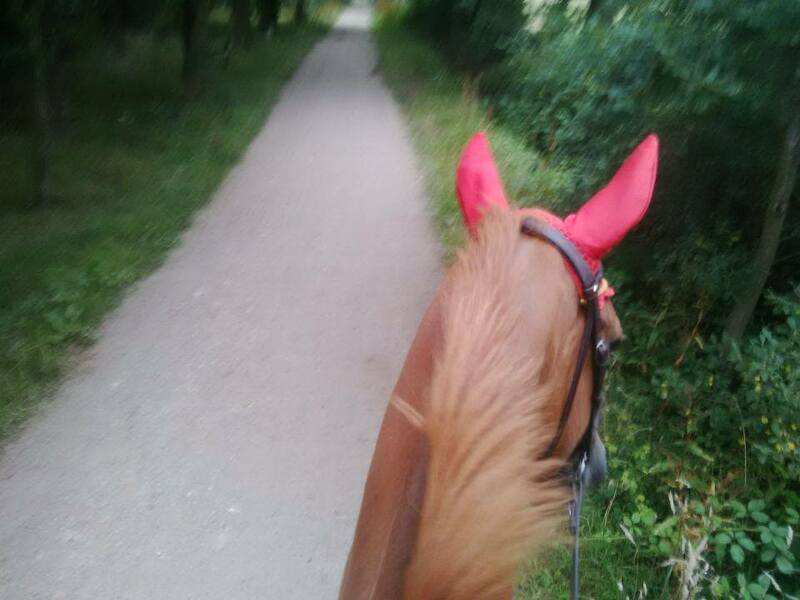 Despite Scottie’s occasional silly behaviour while out hacking, he is an easy hack. He does go out by himself or in company. He can go at the front, middle or the back in company, albeit he is much easier in the middle. If there’s something scary on the road, he will happily stand and wait for cars to pass us before we go past it, in fact he’s always pretty happy to stand and wait for the cars to pass. Even when he is really excited and wants to go for a good canter, he doesn’t pull or charge off. He just bounces until you say go or he realises we’re not doing that. So while he has some irritating hacking habits, he is still pretty well behaved!